I don’t know about you, but I can drink 4 cups of coffee a day (sometimes more when I’m feeling like it). There’s nothing I can do about it. I just love it! If you’re anything like me, you will definitely appreciate what I’ve prepared for you today. I have picked 7 best Nespresso machines, each of which can guarantee you a cup of rich, delicious beverage without the need to go to a coffee shop. Let’s see, which one will become your favorite! The first item on our list of the best Nespresso machines is this small, classy Inissia model. While being able to make a great cup of coffee, it doesn’t take much counter space. It comes with a pack of nice features, so don’t let its compact size fool you. With a powerful 19-bar pressure pump, the Inissia makes espresso and lungo that are always full-bodied and flavorful. This machine is both space and energy saving: it automatically turns off after 9 minutes of inactivity. There’s also a handy compartment for the used capsules, which can hold up to 10 of them. If you want a compact, simple, no-frills machine that can make a good shot of espresso and doesn’t require too much effort from you, the Inissia would be a great option for you. This particular model is very popular, judging by many Nespresso machine reviews. What makes it so special is the versatility that it offers. You can pick among 5 different beverage sizes (espresso, double, espresso, lungo, coffee (7.7 oz.) and Alto (14 oz.) Plus, there’s a complimentary milk frother, which means you can make pretty much any coffee kind you want. This model uses an interesting coffee extraction method called Centrifusion. When you insert a capsule and activate your machine, the capsule starts spinning with the speed of 7,000 rotations per minute while the coffee is being blended with hot water. This results in a rich, bold beverage, which you can mix with foamed milk if you want to take advantage of the complimentary frother. Offering more than just espresso, this model by Breville would be perfect for people who enjoy drinking different kinds of coffee. 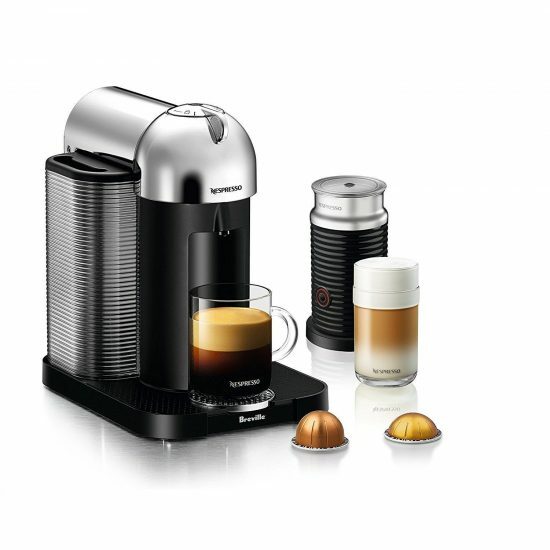 Ideal for espresso lovers, this model deserves to be among the best Nespresso machines. With its big reservoir and a huge compartment for used capsuled, it is large enough for a whole family. And because it dispenses one cup at a time, each of those cups is hot and flavorful. If you think that descaling is unnecessary, think again. When the build-up appears inside of your Nespresso machine, your coffee might start tasting bitter. Additionally, it will not be as flavorful as it’s supposed to be. This model brews only two cup sizes. This is enough for espresso lovers, but you can make other coffee kinds with it as well. The cup tray is adjustable to accommodate different sizes. While the machine looks all high-tech, it’s actually very easy to use and implements simple one-touch controls. This machine, despite being rather simplistic, is a suitable option for many people, especially those who enjoy simple espressos multiple times a day (or share their coffee machine with a family). The next item on our list of the best Nespresso machines is this budget-friendly model by Breville. It has all the necessary features and a smart design. At the same time, it is rather cheap, which makes it suitable for almost any budget. Being among the top cheap espresso machines, the VertuoPlus uses a unique Centrifusion extraction method to get the most out of each coffee pod. It brews three different sizes, which gives you the freedom to adjust your beverage strength. 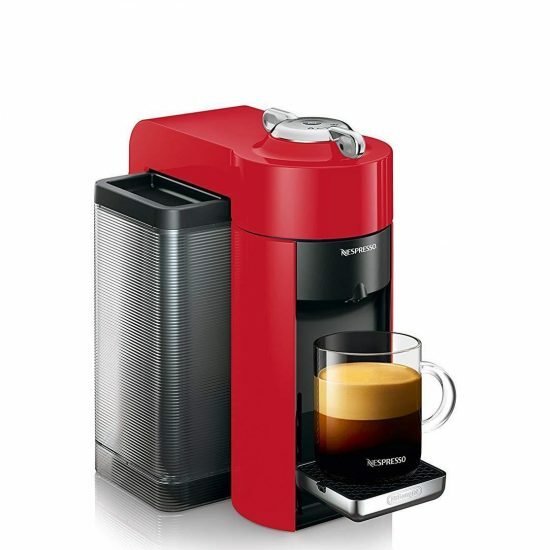 Additionally, it automatically adjusts the brewing setting to each capsule and blend kind. If you need a good cheap espresso machine, the VertuoPlus is the one to go with. Despite some flaws, it brews a great cup of coffee and is very budget-friendly! The next item on our list is given 5 stars in many Nespresso reviews thanks to the great value for money that it offers. While being reasonably priced, it packs a ton of cool features and allows you to be your own barista without making an effort. If you want to get the most out of your coffee pods, you can prep the machine. Before actually starting to brew, run a cycle without inserting the capsule. The hot water will pre-heat the insides of the machine, which will result in a richer flavor. This model implements the 19-bar pressure pump system, which means it makes great-tasting, rich espressos. It also maintains the optimal, stable temperature during its operation, so you can brew multiple cups without the waiting period between each of them. You can make 5 different beverages and experiment with various Nespresso capsule blends to find your favorite unique flavor. To be honest, I feel like this machine can become almost anyone’s favorite. It is great for people who want good value and prefer drinking different beverages, not just straight espressos all the time. If you want a luxury coffee machine, which will do all the work for you, the DeLonghi Nespresso Lattissima Pro would be a perfect option. This model allows for different beverages and doesn’t require much effort from you. This is a home coffee machine, which does half the professional ones do. It foams the milk and automatically adds the needed amounts of it to the beverages of your choice. 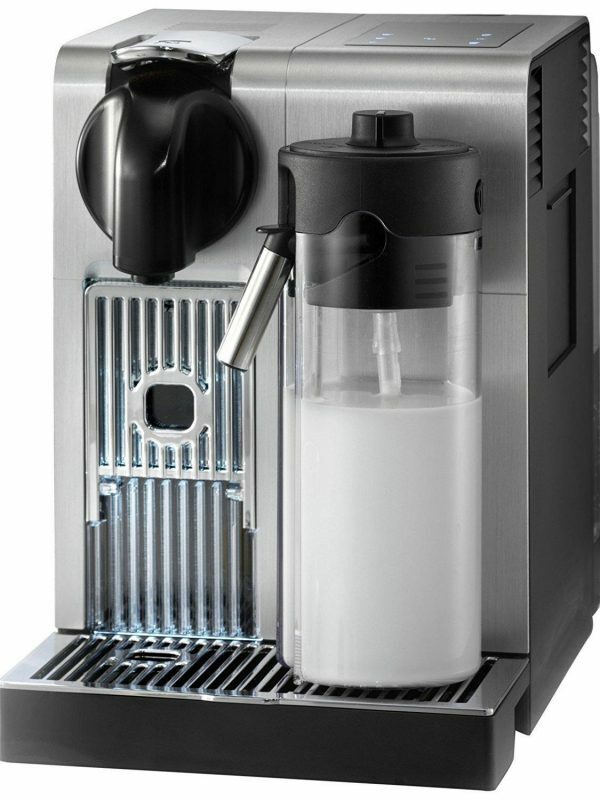 It implements the 19-bar pressure system and brews full-bodied espressos. And of course, it has very intuitive controls, which makes it perfectly suited for home use. This is a Pro model, which can satisfy many coffee enthusiasts. So, if your budget allows for it, I recommend trying this machine out. 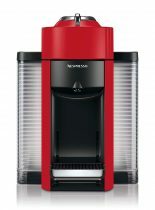 In this Nespresso coffee machine comparison, this particular model stands out thanks to its stylish exterior. Apart from that, it might win you over with its delicious lattes and cappuccinos. It makes amazing, dense foam and adds just the right amount of milk to each beverage. Some users recommend rinsing the machine (running a cycle without a capsule) after each use. This will prevent the build-up and keep your Nespresso operating smoothly longer. And don’t forget to use only the clean, preferably filtered or bottled water. “The Lattissima One Original is one of the cleanest models on the market. This compact machine uses a 19-bar pressure system to extraction. This results in each beverage tasting rich and bold. The heat-up time is 25 seconds for espresso and 40 seconds for milk-based coffees. The machine froths the milk directly into the cup, preserving the warmth of your beverage. Overall, this little machine has the potential to completely change your coffee drinking routine, especially if you love lattes and cappuccinos. What is Nespresso? And why should you buy it? It is natural to ask these questions. Such machines are quite popular these days, but not everyone understands how they work and what they’re all about. Let me explain. Nespresso coffee machines brew coffee using special airtight pods. They run hot water through those pods, allowing the beverage to brew. Yes, it’s that simple. Those pods (or Nespresso cups) come in 16 variations, offering different strengths and flavors. Typically, a Nespresso coffee machine has a minimal number of buttons and simple, intuitive controls. These coffee makers can brew espresso and lungi, but some more advanced models feature milk frothers, which makes them suitable for cappuccino, latte, and other kinds of beverages. These coffee makers are extremely easy to use. There’s no need for a learning curve since these machines are very user-friendly. They are fast. They boil the water fast, and the coffee brewing process doesn’t take much time either. You can enjoy your hot delicious beverage without the need to wait. Generally, they are more affordable than regular espresso machines, which don’t have a coffee pod system. With Nespresso, you can get a good-quality espresso without sacrificing your kitchen space. These machines are quite compact and are suitable even for small living spaces. They offer a variety of beverages. Depending on the model you choose, you can make espresso, latte, lungo, and so on. Some models work with reusable Nespresso pods, which means you can use the ground coffee of your choice. 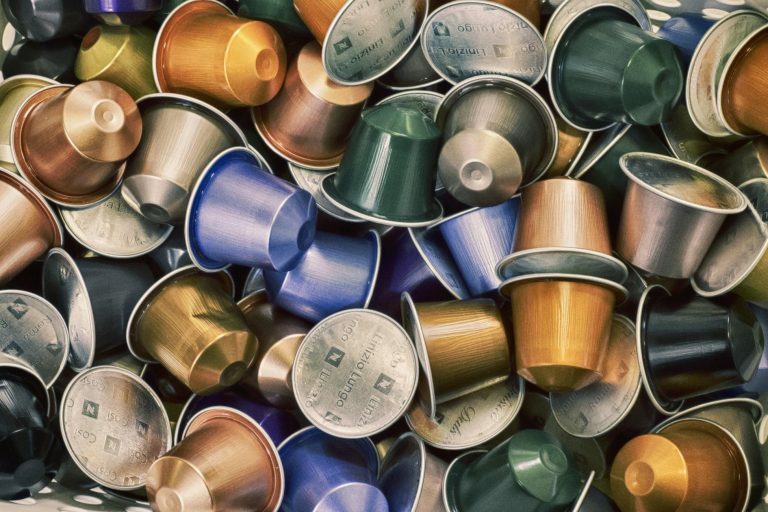 While making coffee at home (instead of going to the coffee shops) can really help you save some money, you should know that those pods (or Nespresso cups) aren’t very cheap. The average price of a 10-capsule set is around $7-10, which doesn’t seem like too much but can mean extra expenses if you drink a lot of coffee. The lack of versatility is another minus. What I mean is Nespresso machines work only with Nespresso pods. You can’t, for example, buy a pack of Dolce Gusto Chococino pods and use them in your Nespresso machine, which kind of limits your freedom in terms of beverage choices. 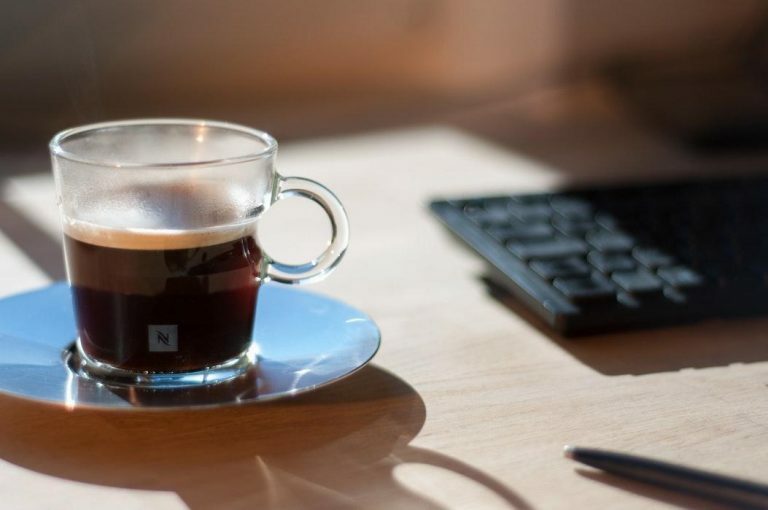 Some Nespresso machine reviews note that even though these coffee makers can brew an excellent shot of espresso, it’s still not as good as beverages made in more professional coffee machines you can find in cafes and coffee shops. If you don’t know how to use your new Nespresso machine, don’t worry. There’s not much to learn. You will find all the instructions in the info booklet, and they are super easy to follow. However, when it comes to cleaning, descaling, and even using your machine for the first time, there are some clear steps you need to take. Let’s start with the first-time use. In this case, you need to run a cycle without inserting the coffee pod. Simply “brew” some hot water into a mug or a container. Wipe the exterior parts of your coffee maker using a damp cloth. Using clean water is the best way to preserve the coffee maker in the best condition. Don’t leave the used coffee pods inside the machine for too long. This can create unnecessary (and harmful for the machine parts) residue. Just throw the capsule away right after you’ve brewed your beverage. The best way to keep your coffee maker running smoothly is descaling it regularly. So, do you want to know how to descale your Nespresso machine? I think you do. Basically, descaling means running a cycle without using a coffee pod. Instead, you mix some water with a descaling solution, pour it into the machine’s water reservoir, and let it go through the system. Some models have automatic descaling, others require you to run a regular cycle (by choosing the cup size) without inserting the pod. As you can see, the process is very simple. However, I highly recommend reading the manual before going with this procedure since different models can have different descaling requirements and peculiarities. A quick tip: if you cannot afford a special descaling solution at the moment (or simply want to save a couple of bucks), you can mix some water with vinegar. Such a mixture will work great for descaling. But don’t forget to run another clean-water cycle to rinse the vinegar out completely. This is crazy, but coffee isn’t just delicious. It can also improve your memory and broaden the attention span. Thankfully, enjoying coffee shop quality beverages without actually leaving your home is real these days. With such a huge number of different coffee machines, you can enjoy this beverage anytime. But how do you pick the right Nespresso machine? You just need to determine your coffee needs and preferences. How much can you spend? Determining your budget will limit the range of available models, which means it will be easier for you to pick just one. Do you want to use your own coffee grounds? If you prefer a specific kind of coffee beans or enjoying mixing them to get unique flavors, you definitely need a machine, which supports reusable Nespresso pods. What coffee kind do you prefer? 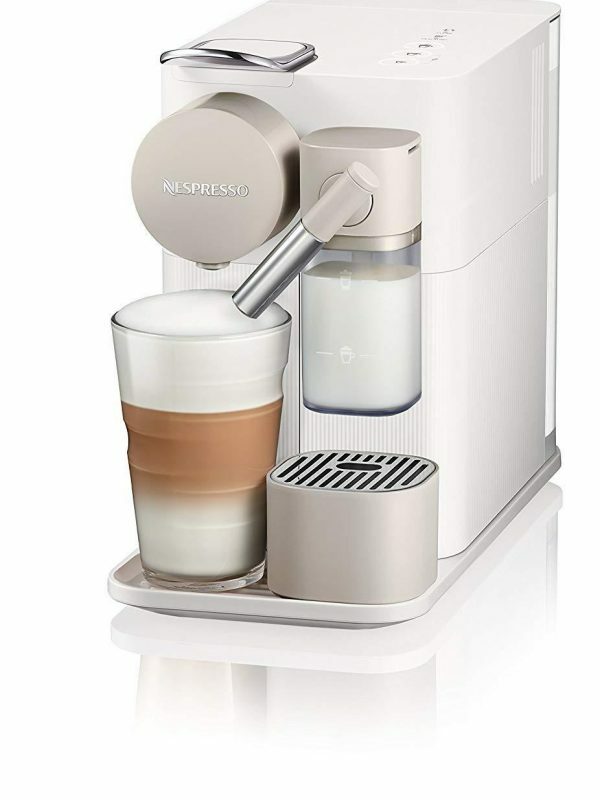 There are two main types of Nespresso machines: espresso/lungo models and the ones with milk frothers. Obviously, if you drink espressos only, you don’t need to pay more for a model with a milk frother. However, if you love lattes and cappuccinos, it might be a good idea to invest more. 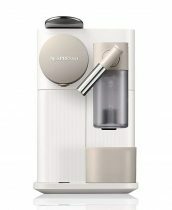 There’s also another option for those who enjoy a good cup of cappuccino occasionally: you can get a Nespresso espresso machine and buy an external milk frother. This is a rather budget-friendly solution. How much coffee do you need? If you live alone or are the only member of your family who enjoys coffee, then you can go with a coffee machine that doesn’t have a very large water reservoir (perhaps even a single-cup serving machine). However, if you live with people who love coffee as much as you do, buying a larger machine (the one that can brew many cups of coffee one after one) would be a better idea. I love starting my day with a good cup of coffee. And luckily, I don’t even have to go to the coffee shop! If you want the same thing, I can recommend one particular Nespresso machine. 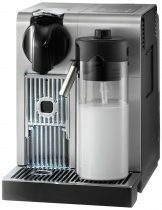 I am talking about the Nespresso Lattissima Plus Original (by De’Longhi). It has everything you might need (and a bit more). It is reasonably priced and makes great espressos. 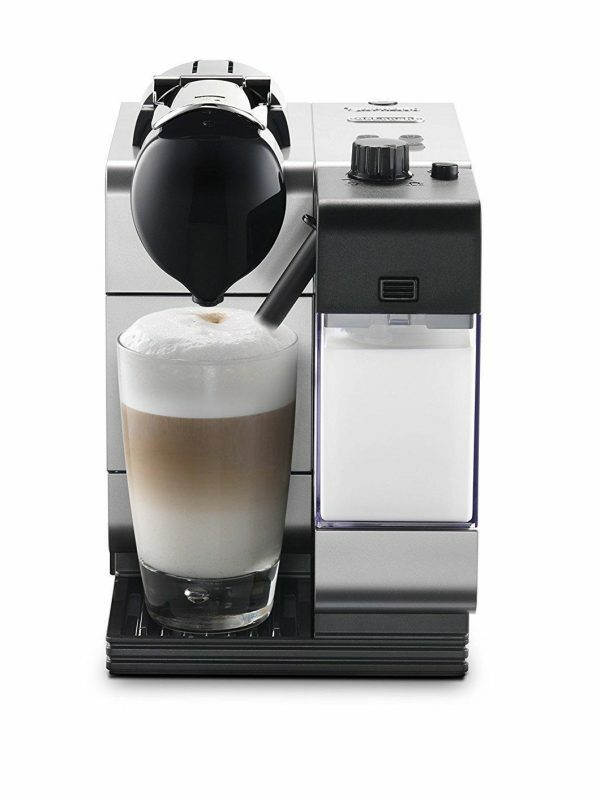 This model comes with an integrated milk frother, so you are not limited to just espressos. So, are you ready to stop running to your local coffee shop every morning? 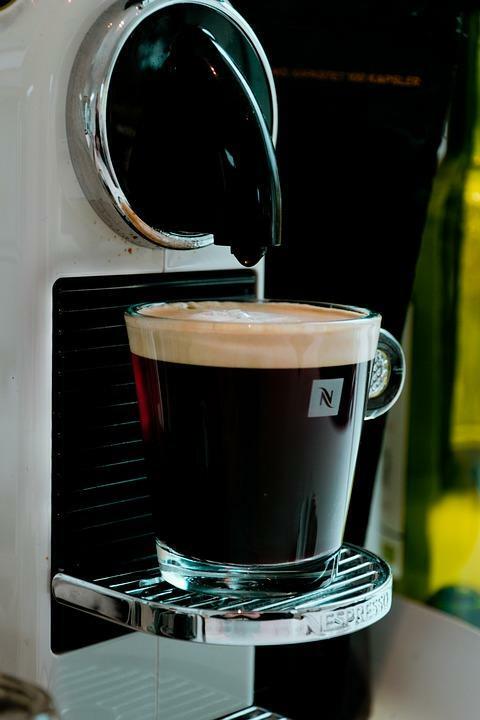 Which Nespresso machine do you think would be a perfect fit? Let us know in the comments below!